HOMESTEAD, Fla. — NASCAR driver, Jimmie Johnson, who won a record five straight titles from 2006 through 2010, just won his sixth Sprint Cup title in eight years on Sunday, November 17, making him one of the fiercest competitors in NASCAR sports history. At the age of 38, Johnson, is now the youngest driver to win six titles, with a career that has plenty more staying power for years to come. 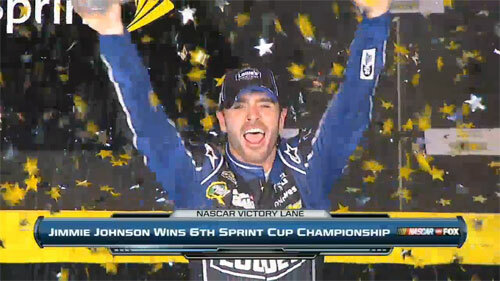 Watch video highlights of Jimmie Johnson’s 6th Nascar win on Nov. 17, 2013. Johnson currently drives the No. 48 Lowe’s Chevrolet SS for Hendrick Motorsports in the Sprint Cup Series. Johnson became the first racing driver to become Associated Press Male Athlete of the Year (U.S.) in 2009, and has won Driver of the Year four times, most recently in 2010. He also topped Forbes.com’s Most Influential Athletes list for two consecutive years (2011, 2012). If you would like to book athletes like Jimmie Johnson for an event, contact Sports Speakers 360’s booking agent for appearance & speaker fees or call 1.855.303.5450.